The upward trend in temperature continues after 2015. Below I describe how you can get the most recent graph. Temperatures have increased by 0.67°C per century between 1880 and 2014. Note: 2016, 2017 & 2018 all hotter than 2015. The more recent graphs reinforce the message gained from the above 2015 graph. Years 2016, 2017 and 2018 have all been significantly hotter than 2015. 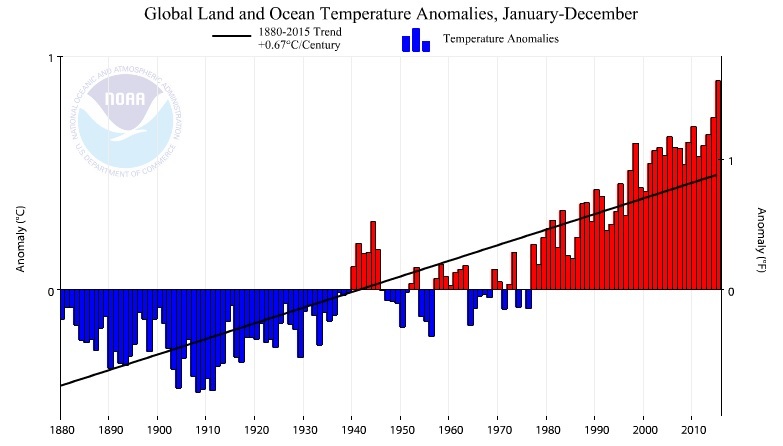 2014 and 2015 are the hottest years shown here. Each “temperature anomaly” is the temperature difference from the average temperature shown in degrees Fahrenheit. The second hottest year was 2014. The temperature increases are already damaging. It is not sustainable for us to have global temperature increasing like this.